Another questionable claim is that the FAANGs have hijacked the market. 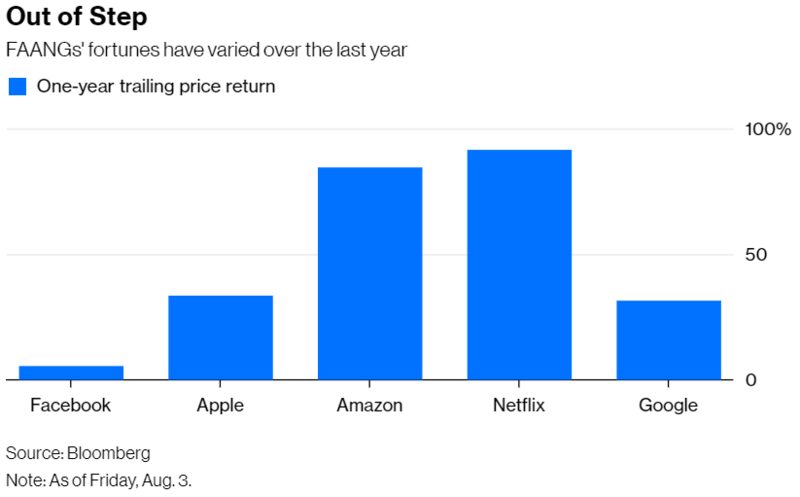 Yes, the FAANGs are giants, four of the five biggest U.S. companies by market capitalization in the S&P 500 Index (Netflix ranks a lowly 34). But they don’t take up an unusually large slice of the market. The five biggest stocks in the S&P 500 have accounted for an average of 12.3 percent of the index since 1990, the earliest year for which numbers available. By comparison, the index’s allocation to the five FAANGs is 12.8 percent. It’s also a mistake to assume that the FAANGs are interchangeable bets. Index provider MSCI Inc. analyzed the five companies using its Factor Classification System, or FaCS. 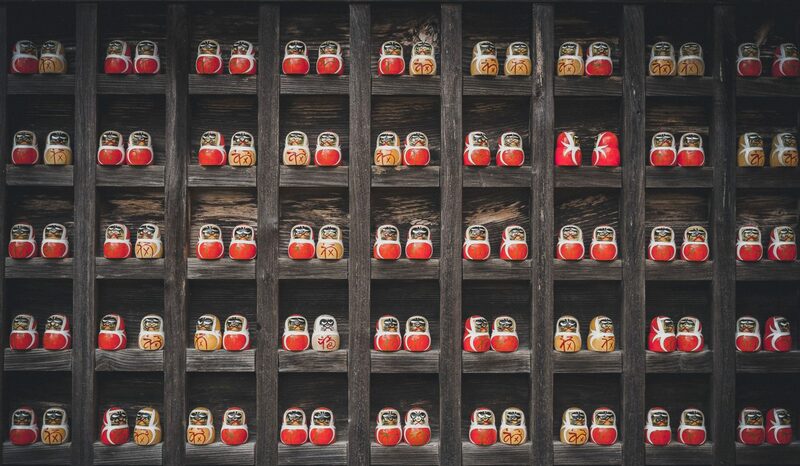 It looks at how each stock compares with the broader global stock market based on various attributes — or factors — that drive returns, such as value, growth, momentum, quality and volatility. The factor scores range from a negative 3 to a positive 3, with a positive number indicating a greater than average exposure to that factor, and vice versa. Lastly, not all FAANG stocks are leading the market higher. Google has a momentum score of just 0.05, as measured by price performance over the last 12 months excluding the most recent month. 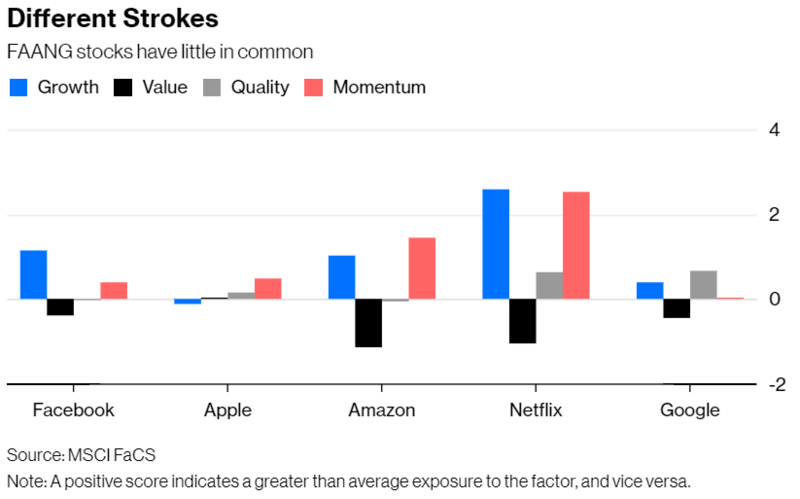 Apple and Facebook score 0.49 and 0.41 for momentum, respectively, or modestly higher than the average stock. There are two obvious lessons here. One, whether investors love or hate this market, the FAANGs have little to do with it. And two, a catchy acronym is no substitute for diligent analysis.